Andover College is situated within half a mile of both the bus and train stations, ensuring it is easily accessible to students from both Andover and the surrounding area. 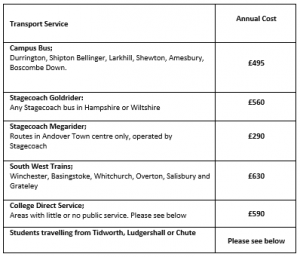 Andover College offers a number of subsidised tickets on Campus buses, Stagecoach buses and South Western Railway. The cost is variable dependent upon your preferred travel choice. All passes are payable in interest free instalments. You may also be able to apply to the learner support funds for assistance. If you require travel to Andover College and there is no public service from your area to get you to the College, it may be possible for the College to subsidise a Campus service from your area. This will be dependent on student numbers and financial viability. It is important to register your interest when you receive the link to the online registration system. Areas previously covered include The Wallops, The Winterbournes, Pewsey, Broughton and Upavon. It is important that your request for travel is received as soon as possible and before 15th June 2018. When Will My College Pass Arrive? If your travel pass is ordered before the deadline you will usually be able to collect this on the first day of term. Unfortunately, if you ordered after the deadline there may be a delay receiving any passes and you will be sent a text when your pass is ready for collection. The availability of the campus direct service will be dependent upon student numbers and financial viability and any delays in application may affect this. For students residing in the Ludgershall, Tidworth or Chute areas Wiltshire Council are able to provide a subsidized travel pass. If your annual income for the tax year ended April 2018 was under £20819 you will be able to obtain a pass through Wiltshire Council for £210 for the academic year, please contact Wiltshire council on 01225 713365. Please apply before 30th June 2018. For students of sixth form age, entitlement to travel is presented in the annual transport policy statement which sets out the assistance available to post 16 students and is published by 31 May each year. For further information or to apply please contact the Home to School Transport team for students with special educational needs on 01962 845327. How Do I Know What Pass to Order?